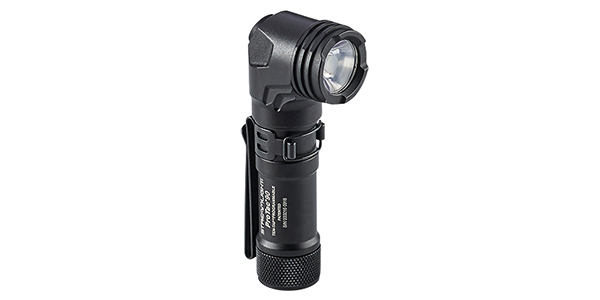 Streamlight, Inc. introduced the ProTac 90, the latest addition to the ProTac series of tactical lights. The ultra-compact, 300-lumen light features a 90-degree head for right-angle lighting, and also permits varied fuel options, including the use of a single CR123A lithium, AA alkaline or AA lithium battery. The ProTac 90 uses the latest in power LED technology for extreme brightness. Offering three different lighting modes, the light features a TEN-TAP programmable switch, which allows for user selection from among three programs: high/strobe/low (factory default); high only; or low/high. When using a CR123A battery, it delivers 300 lumens and 5,400 candela over a 147-meter beam distance on high. Run times range from one hour and 45 minutes to five hours and 30 minutes on high, and from eight hours and 15 minutes to 15 hours on low, depending on battery selection.